QUANTEC, as a System of instrumental biocommunication, wins the Gold Medal for the best innovation in the field of health development over a host of competitors. 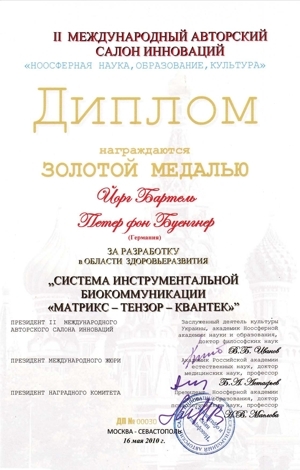 This prize was awarded on the occasion of the 2nd International Authors Salon of Innovations on the Crimean peninsula. The jury consisted of scientists from both Russian and Ukrainian universities, ministries and private institutes.